Researchers identify gated-intermediary neuron system which acts as synaptic cloaking device. In an opensource study published in the journal Current Biology, the researchers found that a class of inhibitory neurons, called somatostatin cells, send out a signal, much like a cloaking device, that silences neighbouring excitatory neurons. Synapses, like a cloaked warship, can’t be seen if they aren’t firing; activating the somatostatin cells makes the synapses and local network of neurons invisible to researchers. The team explain it was totally unexpected that these cells would work this way. Changing the activity of just this one cell type can allow researchers to change the brain’s circuit structure at will. This could dramatically change how the medical community look at, and use, the connectome. The researchers discovered this synaptic cloaking device whilst they were conducting their normal research and noticed that something just didn’t look quite right. The team noticed that the synapses in the current study were not behaving the way that previous studies had reported. Prior research reported that the synapses should be strong and reliable, and that they should always grow and strengthen in response to a stimulus. But the neurons the team looked at were weak and unreliable. The difference between the current research and the previously completed work was that the current study was being performed under real-life conditions. Prior research on synapse function was performed under conditions optimized for observing synapses. However, such experimental conditions don’t reflect the noisy brain environment in which synapses normally exist. The team state that this is the black box in neuroscience, adding that researchers know how to make synapses stronger in a dish. But what’s going on in the brain to initiate synaptic strengthening in real life?. To find the answer the team looked at neurons in the brain’s neocortex that were functioning under normal, noisy conditions. They took paired-cell recordings from pyramidal cells, a type of excitatory neuron, and found that many of the synapses between the neurons were not functioning, or functioning at an unexpectedly low level. The group then recorded the activity of somatostatin cells, a type of inhibitory neuron, and found that those neurons were much more active than expected. In fact the somatostatin cells were so active, the team wondered if they could possibly be driving the inhibition of synapses. To test their hypothesis the team turned to optogenetics, a technique that controls neurons with light. The researchers used light to trigger an enzyme that activated and deactivated the somatostatin neuron. When the somatostatin cells were turned off, synapses grew big and strong. When the cells were turned on, the synapses became weaker and in some cases, disappeared entirely. The team note that humans have inputs coming at them all the time and wonder why a person remember one thing and not the other. They theorise that somatostatin neurons may be gating whether synapses are used, and whether they can be changed during some important event, to enable learning. The researchers found that when the somatostatin neurons were turned on, this triggered the cloaking device. The neuron activated the GABAb receptors on hundreds of excitatory neurons in the immediate area. Activating this receptor suppressed the excitatory neurons, which prevented them from creating and strengthening synapses, and made them invisible to researchers. The researchers plan to see if the somatostatin cells behave similarly in other areas of the brain. If they do, it could represent a novel target for studying and improving learning and memory. Direct Synaptic Connections between L2 Pyramidal Neurons Are Suppressed by Network Activity. (A) A bright-field image showing the barrel cortex and the location ofpatch electrodes in layer 2. The scale bar represents 200 mm. 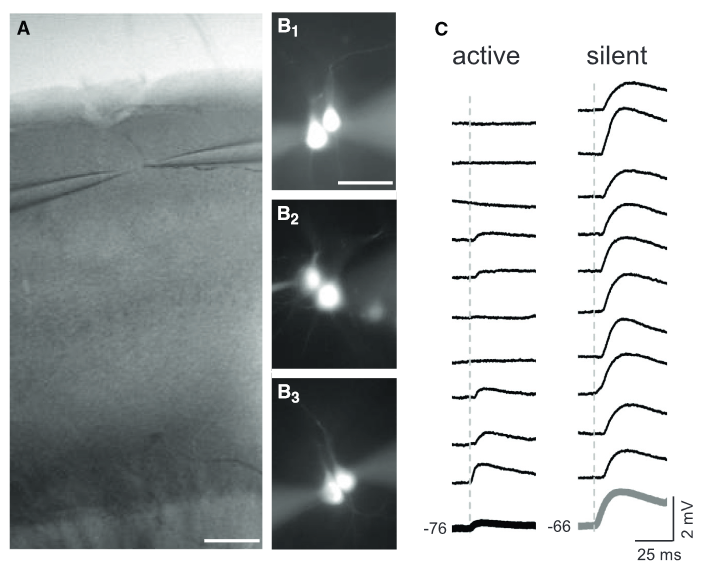 (B) The location of cell soma for unconnected or connected pyramidal cells was similar. (B1) Two Alexa-Fluor- filled, unconnected pyramidal cells. (B2 and B3) Two pyramidal cells connected unidirectionally and bidirectionally, respectively. (C) Individual response trials for a representative connected pair under active network conditions (left) and for a different connected pair under silent network conditions (right). Bottom trace (bold) is ten-trial average for each connection. Neocortical Somatostatin Neurons Reversibly Silence Excitatory Transmission via GABAb Receptors. Barth et al 2015.